My husband and I have used Swiss brand Kuhn Rikon kitchen gadgets for years. Their in-house design team continually creates products that have garnered the company awards for their pots, frying pans and gadgets. 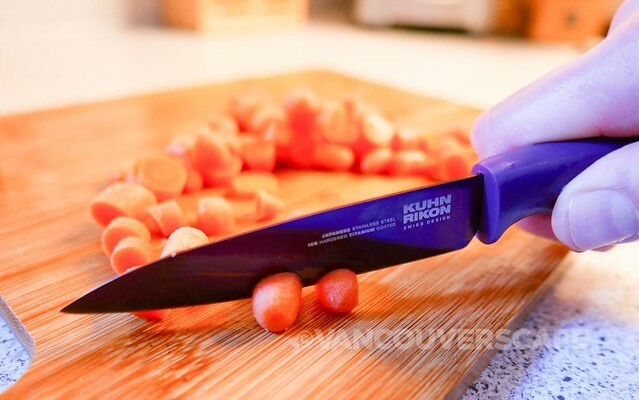 We’re fans of their Red Dot Award-winning ergonomic ratchet spice grinder and small, colourful Colori® knives in particular, so when Kuhn Rikon invited us to check out their recently-launched Colori® Titanium range, we were happy to oblige. Strength and elegant modern design combine to create the Colori® Titanium series. The ice-hardened Japanese stainless steel blade guarantees long-lasting sharpness and performance. Ice-hardening the blade allows the steel to reach maximum strength. The titanium coating on the blade not only creates an elegant shine, but also protects and strengthens the nonstick blade even further. These sleek knives have garnered Kuhn Rikon an iF World Design Guide Award. We selected three knives from the collection: the Colori® Titanium Chef’s Knife, Colori® Titanium Serrated Utility Knife and Colori® Titanium Paring Knife. 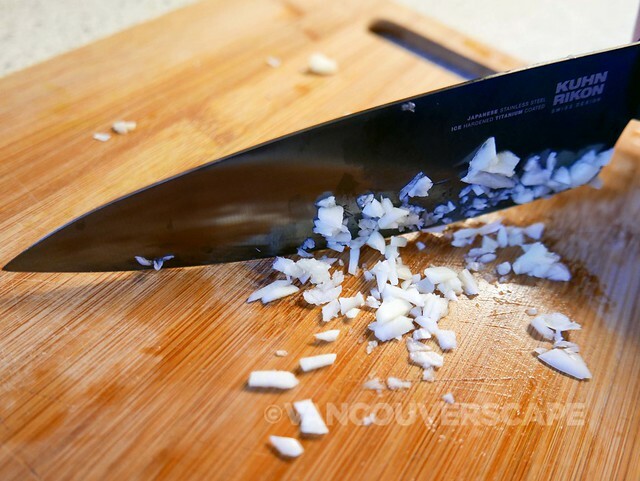 The Colori® Titanium Chef’s Knife is our all-around favourite for dicing, chopping and mincing. 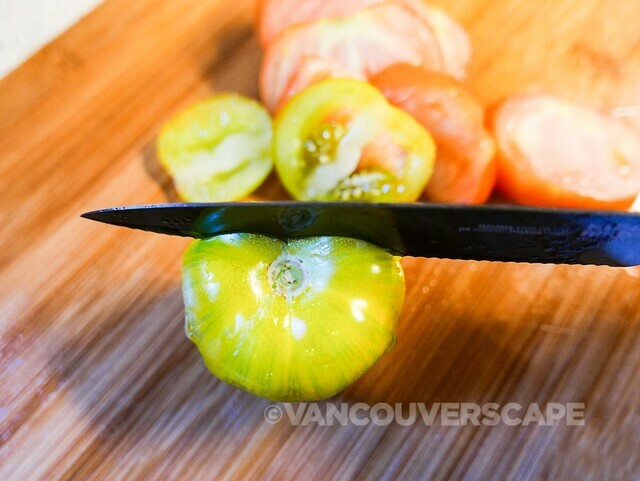 The Colori® Titanium Serrated Utility Knife has a 5 1/4” blade, perfect for slicing smooth-skinned fruits and vegetables, bread or meat. The Colori® Titanium Paring Knife with its 4” blade is a sharp all-purpose knife handy for kitchen prep — from peeling apples to chopping vegetables. The unique colours of Colori® Titanium knives result from different Titanium compounds on the surface. Adding carbon, nitrogen or oxygen to titanium creates black, rose gold, purple, green and blue surfaces. The colors are unique to these compounds and are not achieved by pigments. Ours is in a lovely shade of deep purple! 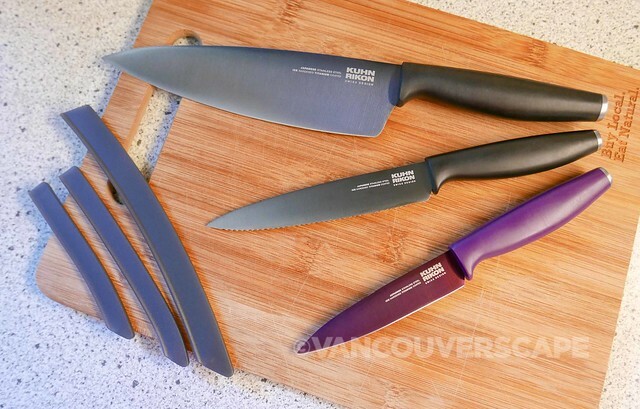 Though these knives are listed as dishwasher safe, washing by hand and air drying is recommended. Each knife comes with a matching safety sheaf to keep the blade sharp. Kuhn Rikon products also come with a two-year warranty. 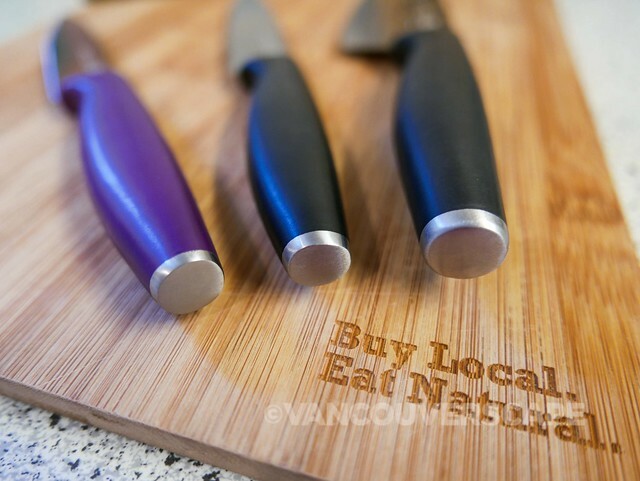 Find a local retailer online. Non-watermarked images courtesy of Kuhn Rikon.